Lawrence Ferlinghetti’s name does not appear in any First Amendment treatise or casebook. And yet when the best-selling poet and proprietor of City Lights Books was indicted under California law for publishing and selling Allen Ginsberg’s poem, Howl, Ferglinghetti buttressed the tradition of dissident expression and ended an era when minds were still closed, candid literature still taboo, and when selling banned books was considered a crime. 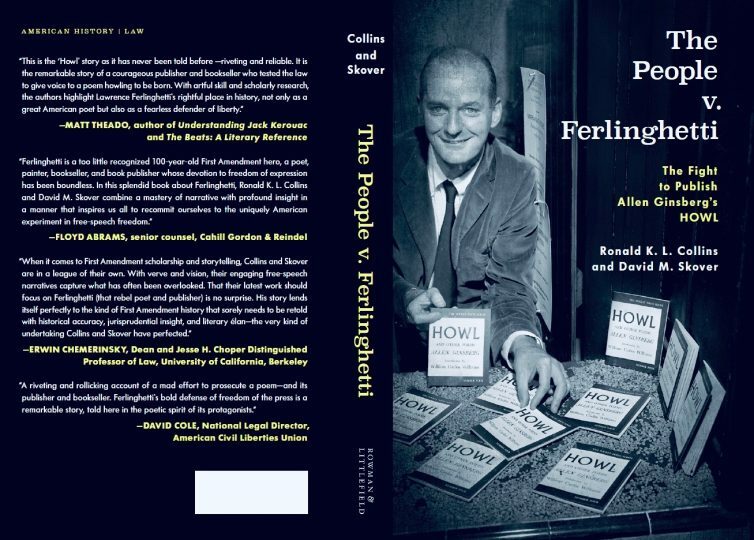 The People v. Ferlinghetti is the story of a rebellious poet, a revolutionary poem, an intrepid book publisher, and a bookseller unintimidated by federal or local officials. There is much color in that story: the bizarre twists of the trial, the swagger of the lead lawyer, the savvy of the young ACLU lawyer, and the surprise verdict of the Sunday school teacher who presided as judge. With a novelist’s flair, noted free speech authorities, Ronald K. L. Collins and David Skover tell the true story of an American maverick who refused to play it safe and who in the process gave staying power to freedom of the press in America. 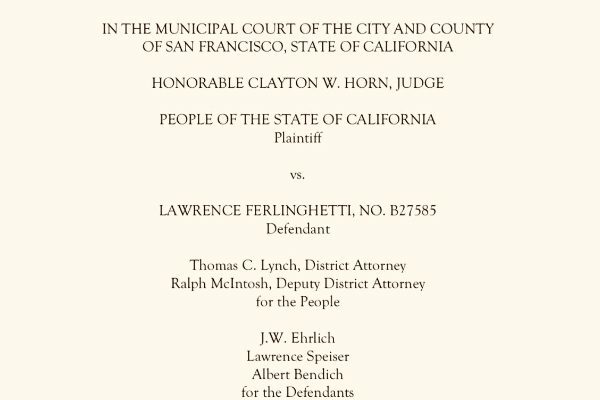 The People v. Ferlinghetti will be of interest to anyone interested [in] the history of free speech in America and the history of the Beat poets. [W]hether an act of publication that would otherwise be protected by the First Amendment loses that protection simply because a source acquired the published information unlawfully. The Center for Western Civilization, Thought & Policy will host law professor Laura Weinrib for an event on Wed. March 20. Weinrib’s lecture “The First Weaponization of the First Amendment,” will discuss how the first amendment first became “weaponized” in the 1930s and how that has affected constitutional rights today. She is speaking as part of the Western Civ Dialogue Series. 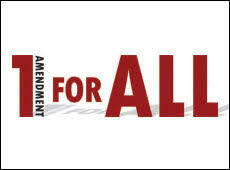 Weinrib’s lecture will explain how in the 30s, radical labor activists first weaponized the first amendment. She argues that the unusual coalition between the activists and business leaders helped to make judicial enforcement of free speech a central feature of American constitutional democracy. Weinrib will explain how this forgotten bargain backfired and how it has implicated the contest over constitutional rights in the present day. Sponsors: LeRoy Keller Center for the Study of the First Amendment, the CU Boulder History Department, and the Center for Communication and Democratic Engagement. Location: Hale Science, room 270, beginning at 5:30 pm. The discussion will be followed by a Q&A session and a small reception. Register: via CU Events Calendar. Students, faculty, and members of the public are encouraged to attend the lecture. In state courts across the Nation, an absolutist conception of the First Amendment is preempting common law speech torts. From intentional infliction of emotional distress and intrusion upon seclusion, to intentional interference with contractual relations and negligent infliction of emotional distress, state courts are dismissing speech tort claims on the pleadings because of the broad First Amendment defense recognized by Snyder v. Phelps in 2011. This Article argues, contrary to the scholarly consensus, that Snyder was a categorical departure from the methodology adopted by New York Times Co. v. Sullivan, the landmark 1964 case that first applied the First Amendment against state common law. Sullivan, on the one hand, was a classical common law decision, taking the internal point of view with respect to state common law. Snyder, on the other, was only concerned with the existence of protected speech, an issue for which state common law was irrelevant. This Article contends that Snyder’s absolutism has negative systemic consequences for judicial federalism: courts are unnecessarily prevented from judging certain conduct right or wrong under the local standards of state tort law, even if the First Amendment ultimately immunizes a defendant from liability. Sullivan’s methodology is better than Snyder’s because it embraced cooperative judicial federalism. Sullivan has underwritten fifty years of productive state-federal judicial dialogue; in just seven years, Snyder has censored every significant opportunity for cross-systemic judicial conversation. → Go here for more information. Fox News’ Shepard Smith was honored on Wednesday night at the Radio Television Digital News Foundation’s 29th annual First Amendment Awards dinner in Washington, D.C., where he received the Leonard Zeidenberg First Amendment Award. Smith, the chief news anchor and managing editor for the network’s breaking news division, said he was ‘humbled and thankful’ to receive the award, which previously was given to broadcasting legends David Brinkley, John Chancellor, Mike Wallace and Walter Cronkite.